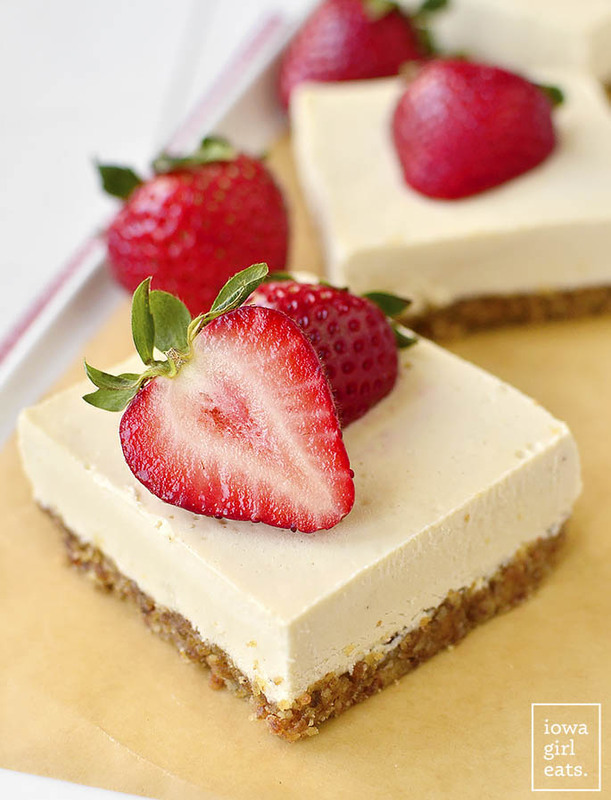 No-Bake Strawberry Cheesecake Bars are incredibly decadent yet perfect for a less-guilt sweet treat. 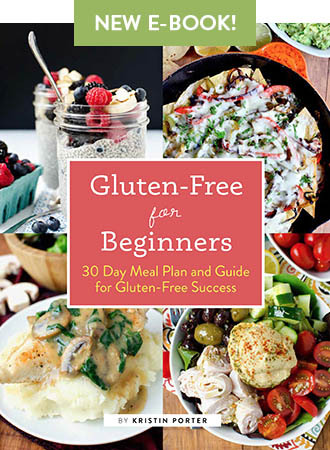 Gluten-free and vegan, too! Happy Friday, everyone – WE MADE IT. Was it just me, or did this week seem to move backwards at times? Oof. Anyway, there’s another reason to celebrate because I’ve got a sweet treat to welcome you to the weekend. Keep your ovens off though, because No-Bake Strawberry Cheesecake Bars are, well, no-bake and set up completely in the freezer! The recipe for these less-guilt, refined sugar-free, gluten-free, and vegan cheesecake bars is coming at you courtesy of my friend Dana’s new cookbook, Minimalist Baker’s Everyday Cooking – I think I screamed a little when this baby hit my doorstep! 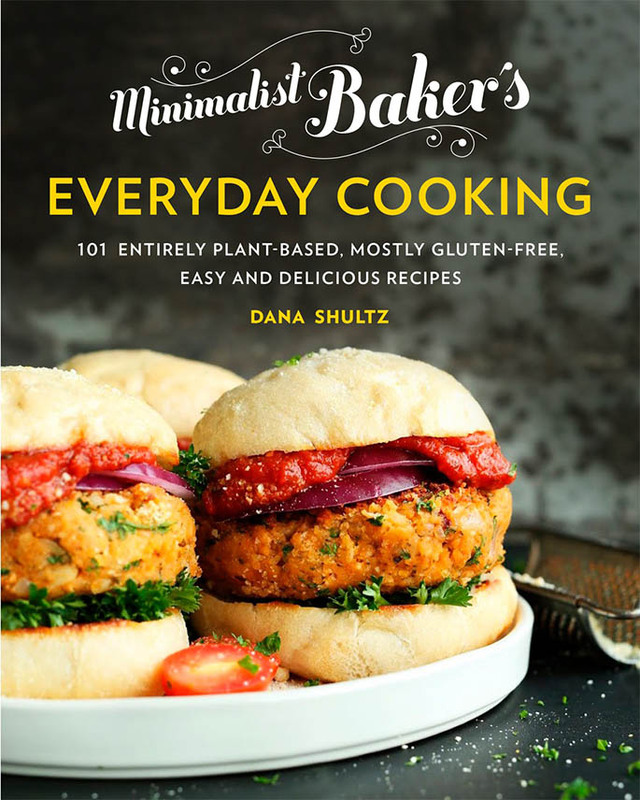 In case you don’t know, Dana is the mastermind behind Minimalist Baker where all recipes are not only plant-based and mostly gluten-free, but can be made with 10 ingredients or less, in 1 bowl, or in 30 minutes or less. If you’re interested in plant-based foods that don’t taste like plants, Dana’s your girl. After sitting down and immediately bookmarking 15+ recipes, I decided on Dana’s No-Bake Strawberry Cheesecake Bars to share with you. Mainly because I’ve been craving strawberry cheesecake for over a month now, but also because Ben and I just went to a new-to-us restaurant and my man was handed a mascarpone-based cheesecake with pepper crumble for dessert instead of the classic New York-style cheesecake with strawberry sauce that he thought he was getting (which of course was eaten, but without much enthusiasm.) 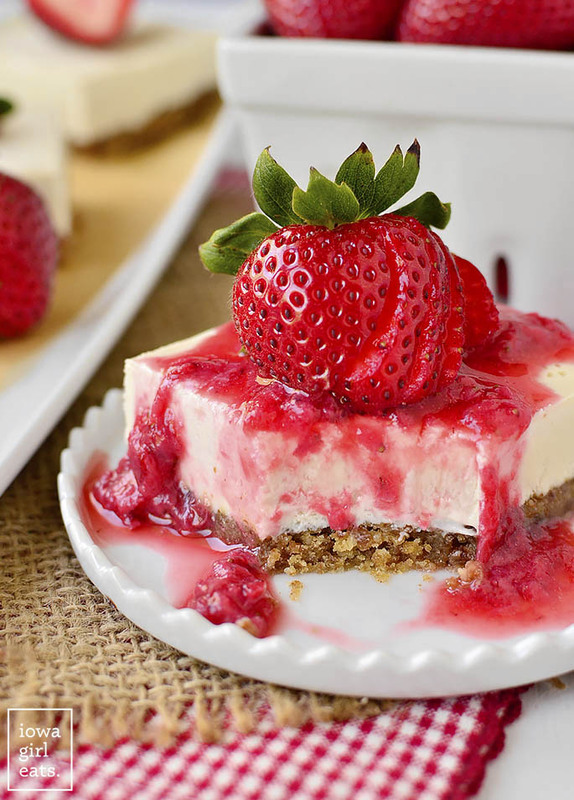 Did I mention I’ve been craving strawberry cheesecake? It was a no brainer! I instantly deemed this recipe a success because Lincoln loved it. Little man doesn’t get to eat a lot of desserts because, yes, I’m a little crazy about toddlers and sugar, but also because of his dairy allergy. As a Mom, it felt unbelievable to give him something that tasted sweet and decadent but was SAFE for him to eat, and me too! The recipe also came together exactly like the directions said it would. 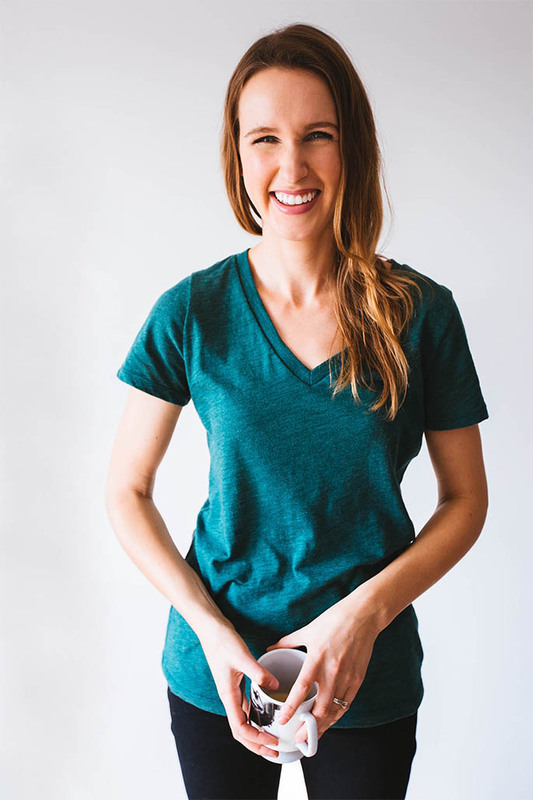 Dana includes weight measurements in all her recipes so you can be sure they’ll turn out exactly the same in your kitchen, as hers. So helpful. 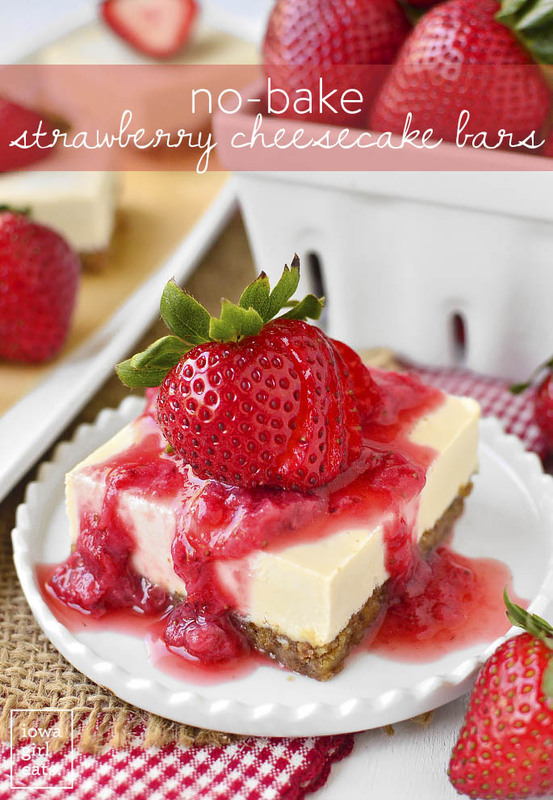 Lastly, these No-Bake Strawberry Cheesecake Bars are just HEAVENLY! Creamy and rich like regular cheesecake, but made with coconut milk and sweetened with maple syrup instead of refined sugar. I was absolutely thrilled with how they turned out, and the fresh strawberry topping really made each bar taste like the “real thing”. Perfect to serve at a BBQ, picnic, or even as a nice treat after family dinner since they can be sliced and eaten straight out of the freezer. 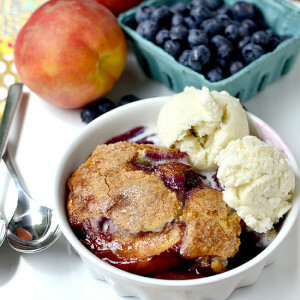 We will be making and eating these all summer long. 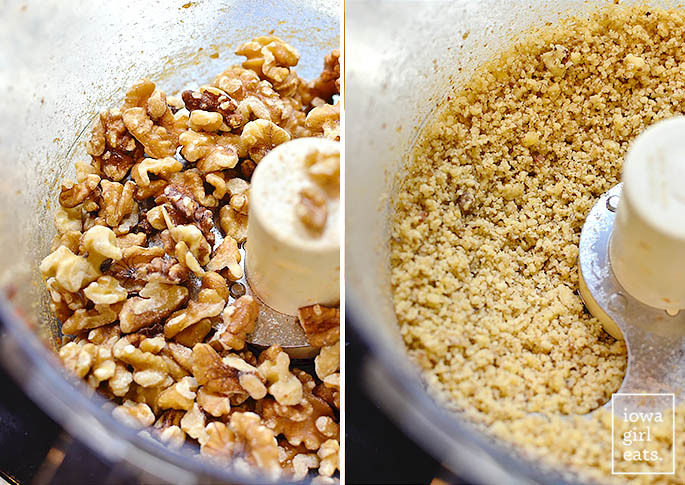 Start by making the cheesecake crust, which is simply a mixture of walnuts, dates, and a pinch of salt. 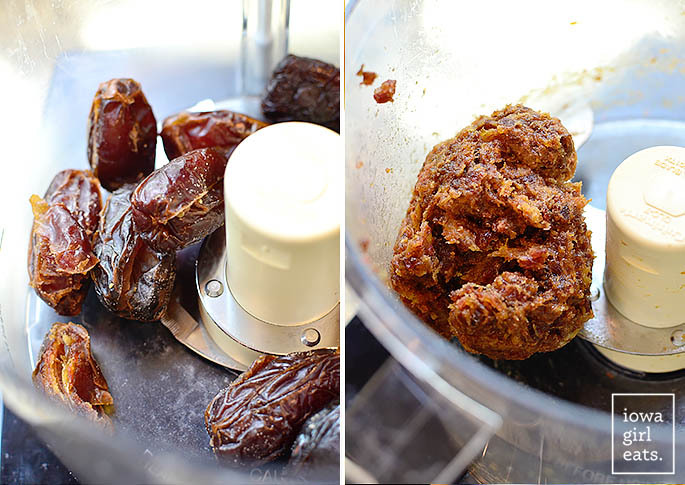 Add 1 cup pitted medjool dates to the bowl of a food processor then process until the dates are finely chopped and come together in a ball, then remove to a bowl. Next add 1-1/2 cups raw walnuts to the bowl then process until they’ve reached a fine meal. 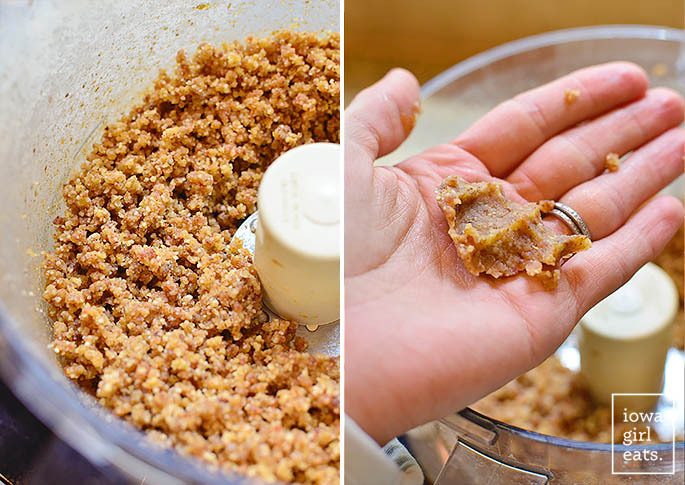 Add the dates back in with a pinch of salt then process until the ingredients are well combined and stick together when you pinch a little between your fingers. 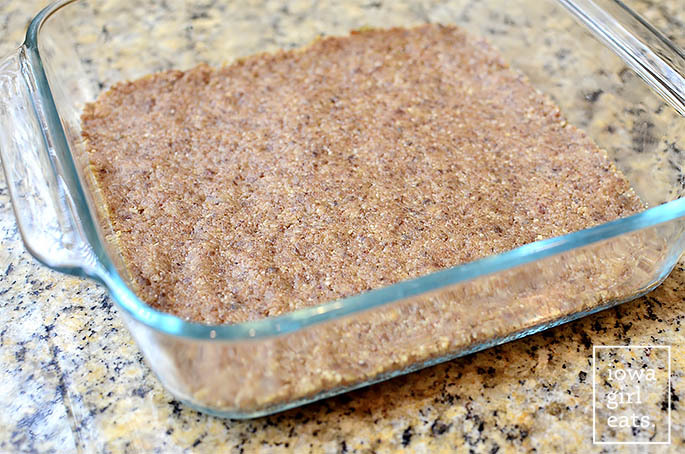 Dump the mixture into an 8×8 baking dish then use your hands to press into an even layer. Crust = done. Easiest cheesecake crust you ever made, right?! Pop the dish into the freezer to setup while you get the cheesecake mixture ready. You’ll need 1-1/2 cups raw cashews that have been soaking in water for 6-8 hours, or in boiling water for 1 hour, which is what I did. 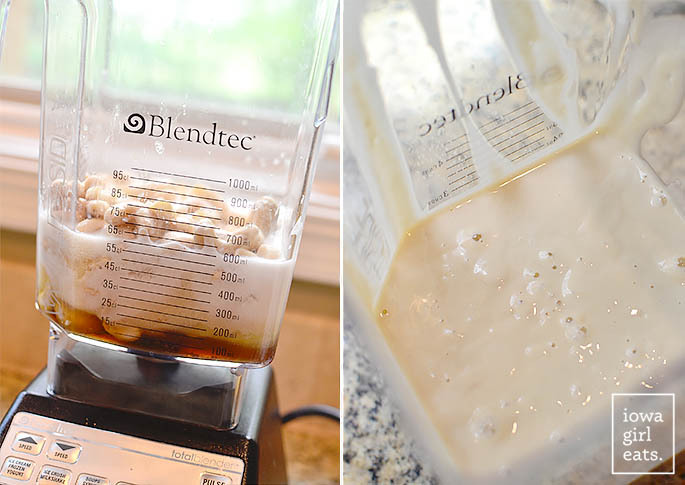 Drain the cashews then add them to a blender (love my Blendtec!) with 1 cup full-fat or light coconut milk (I went full fat,) 1/2 teaspoon pure vanilla extract, 1/2 cup pure maple syrup (not pancake syrup,) 3 Tablespoons melted coconut oil, and 2 Tablespoons lemon juice. Blend until extremely smooth then add more maple syrup or lemon juice as needed for extra sweetness or tartness. I ended up adding a liiiitle more lemon juice. Pull the baking dish with the crust out of the freezer then pour the cheesecake mixture on top. Tap gently on the countertop to pop any bubbles and/or use the back of a spoon to smooth. Cover loosely with plastic wrap then freeze for another couple of hours or until set. Cheesecake = done! Last step is to make the strawberry sauce which really makes these bars taste like the “real thing”. 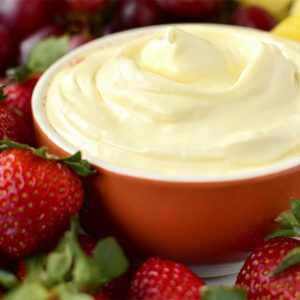 In a saucepan combine 2 cups fresh strawberries, 1-2 Tablespoons maple syrup, 1 Tablespoon cornstarch or arrowroot starch (NOTE: I did not use) and 2–3 Tablespoons water. 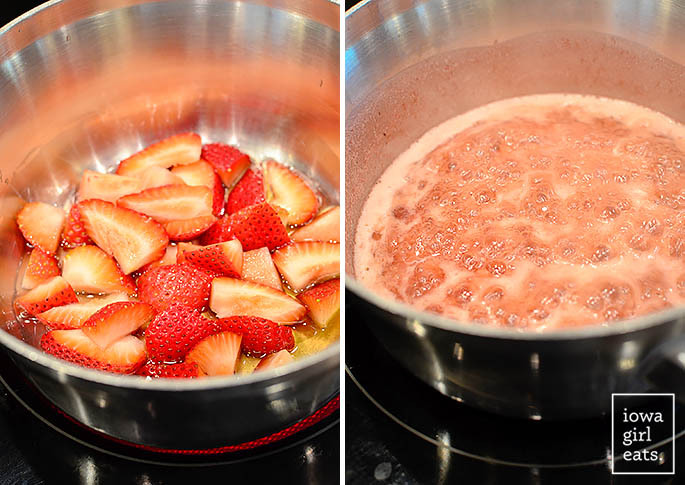 Bring to a simmer over medium heat then start mashing the strawberries until they’ve reached your desired consistency. Simmer until slightly thickened then let cool. Let the bars sit out for 15-20 minutes to make them easier to slice, then top with the strawberry sauce and devour. 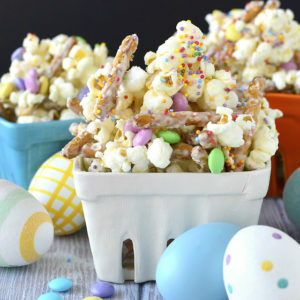 The longer the bars sit out, the creamier (and more ridiculously fabulous!) they’ll get. Hope you enjoy! 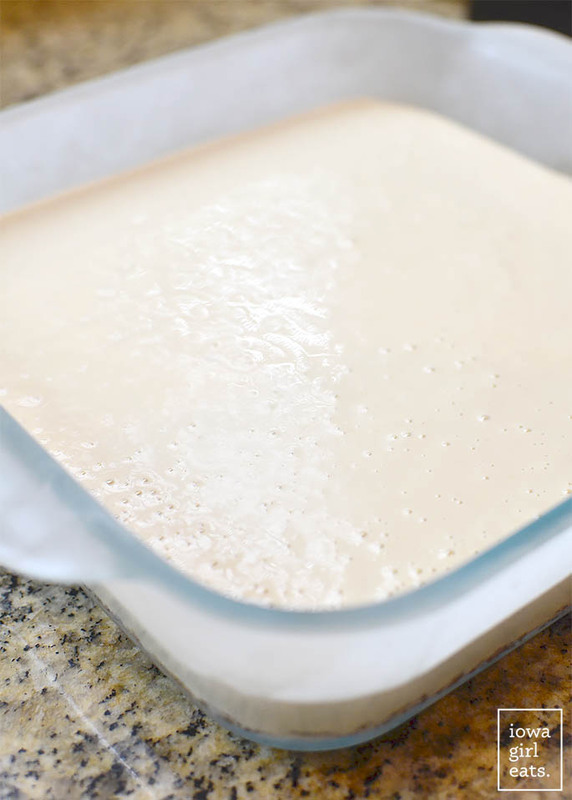 Line an 8×8–inch (or similar size) baking dish with parchment paper or plastic wrap and add the crust. Spread in an even layer and press down with your hands for a uniformly flat crust. Place in the freezer to set. Blend on high until puréed, creamy, and smooth. If there is trouble blending, add a bit more liquid (either coconut milk or coconut oil) to help the process along. Scrape down the sides as needed. Taste and adjust the flavors as needed, adding more maple syrup for sweetness, or lemon juice for acidity. 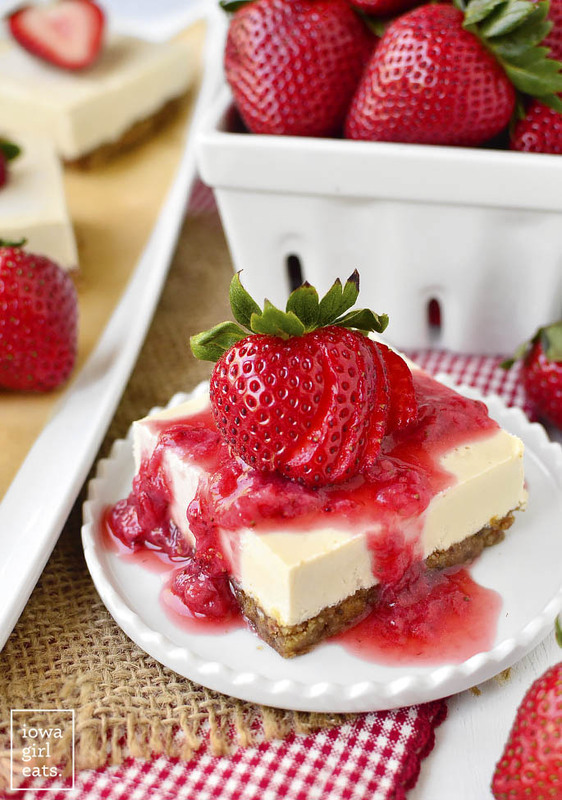 Spread the chilled strawberry topping over the hardened cheesecake (or serve separately), slice into bars, and serve. Coconut Whipped Cream makes an excellent topping. 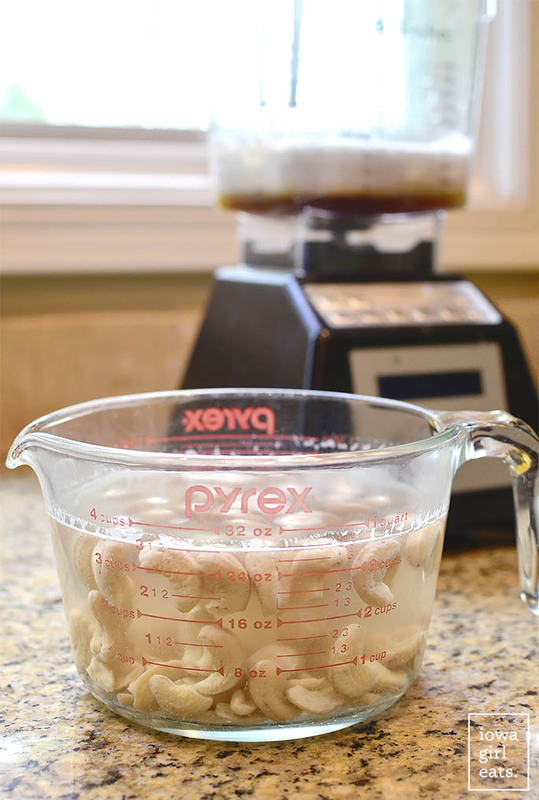 Soak the cashews for 6–8 hours in cool water, or pour boiling water over cashews and let rest uncovered at room temperature for 1 hour. Drain and proceed with the recipe as instructed. 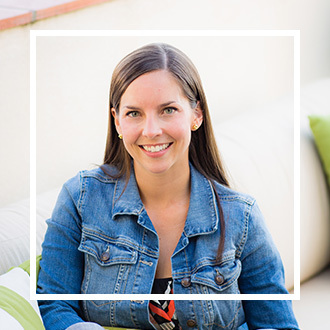 I have always loved her blog but have been scared to try anything. But if you say your husband (who seems just like mine! 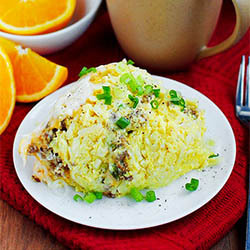 LOL) liked this recipe I might need to be more adventurous! Thanks for sharing! I highly recommend making one (or many) of Dana’s recipes. We are not vegans in my house, but I make her dinners all the time. We LOVE them. 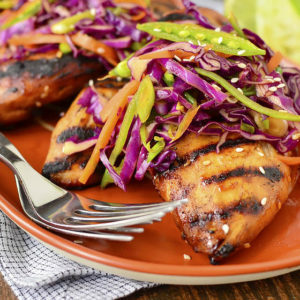 So flavorful and well-balanced and healthy. You won’t even think about the fact they are vegan. As a caveat, I’ve never made any of her desserts, but her breakfast/dinner recipes are the best. Okay, these look and sound AMAZING! And such clean ingredients, love it. 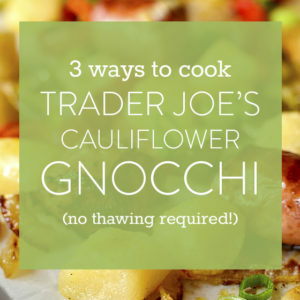 I need to snag this cookbook! 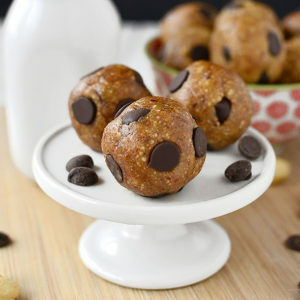 Where do you find raw cashews? I tried finding these to make one your previous smoothies. I ended up using regular cashews. Lol. Thank you for the step-by-step pictures! The dessert looks really decadent and delicious. These look fantastic – thanks for sharing! I love all your recipes. Can you clarify the “olive oil melted coconut oil” direction in the recipe? Thank you! If I could eat these bars for every meal I could totally be vegan! Oh, man, this looks SO incredible! I’ve always been curious about cashews in vegan cheesecake and I can’t wait to get a blender to give this wonderful recipe a try. Thanks for sharing! These look incredible! Dana’s recipe never disappoint. I don’t think I was ever so excited as I was when I got my cookbook in the mail!! I was always a cheesecake gal, so I’m super happy there’s vegan options for me now. So yummy! Because I’m not vegan, nor gluten- or dairy-sensitive (my blog’s even called MAK and Her Cheese lol), I’ve always been hesitant to cook with dairy alternatives like cashews and coconut milk. I guess my reasoning is that I don’t NEED to, so why take the risk of trying something new (or what many of my friends and family members would consider weird). 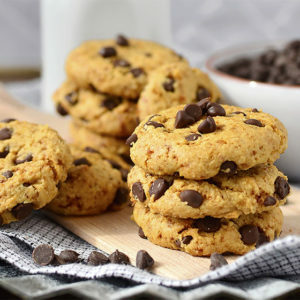 But I also feel that many vegan/dairy-free recipes, like these bars for example, can be perfectly worthy and delicious in themselves; labeling foods as “alternatives” or “substitutes” attaches a stigma that makes people weary that they won’t be as good as the “real thing.” I love that you’re not vegan but enjoy these recipes anyway. I should really give them a try! Thanks for the inspiration! Absolutely, Margaret Ann! 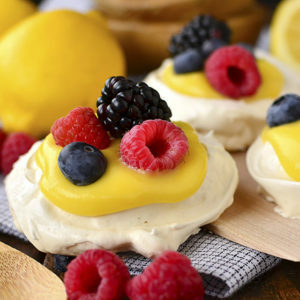 I used to feel the same way until I “had” to try some alternative desserts and realized they are delicious all on their own! These look great…one question…if I’m allergic to walnuts do you think I could substitute pecans and get the same crust results? Wasn’t your son allergic to cashews? Did he outgrow it? Looks delicious, though! One of my nephews is, unfortunately – my guy is just dairy! Was so excited to try these tonight… But after 3 hours in the freezer, they were still completely unsolidified, watery even. Any suggestions? Oh no, that’s not good! The only thing I can think of is that maybe you used coconut water instead of coconut milk (which should be really thick and creamy vs watery)? Could that be it? FYI- you have a reader in Singapore. I’m a MN girl (where I discovered your blog from a friend) but we’re living overseas for my husband’s job. 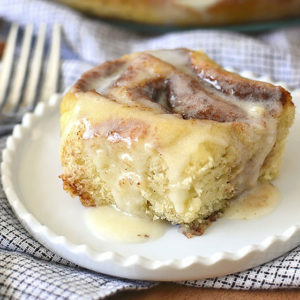 I dislike Maple Syrup :( could I use Agave Nectar or Honey as an alternative? Hi Ellen! I just checked the cookbook and it says you can substitute up to half the maple syrup with sugar. Honestly the maple flavor is hardly, if at all, detectable, in this recipe as written! I was working on one today and found that 0.5% FLV Greek Yogurt in my cheesecake recipe gave things a bright cheesy creamy dimension pretty distinct from the kind you get with CAP NY Cheesecake or TFA Cheesecake GC. Also brightened up and imparted some tartness to the strawberry in a nice way vs. Lemon Sicily which just kind of muted things. The coconut flavor is a little too strong for me. I think I would almond milk and olive oil next time. I’m very excited to find your site. I have celiac’s, my sister is vegan and my niece has dairy allergies. 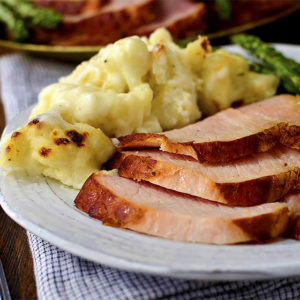 It’s challenging to prepare a safe, different and delicious family meal considering everyone’s dietary requirements. I just stumbled upon your recipes searching for some new ideas and EUREKA! ; I’m IN LUCK!!! 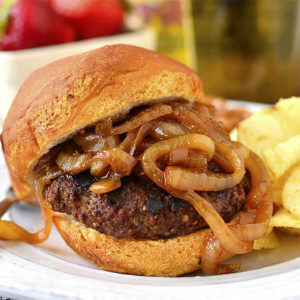 Tradditional type dinner ideas with today’s dietary demands in mind for the whole family. I ended up having so many already; and shared some too.